Diani Beach Kenya is one of the most beautiful beaches in the entire world. Here your dreams of how paradise should look come true. Lying on the shores of the Indian Ocean and bordered by a magnificent coral reef, Diani Beach is an impressive paradise, ideal for swimming and water sports all year round. Diani Beach stretches over 10 kilometers and has been voted as the leading beach destination in Africa and among the top beaches worldwide. 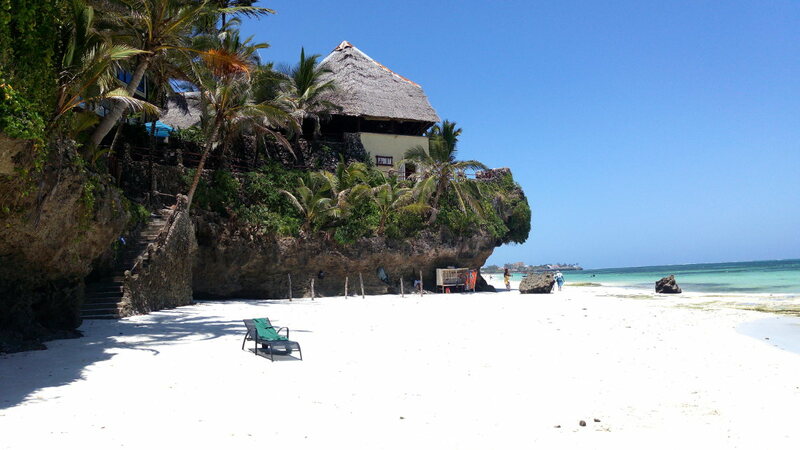 Boarded by Tiwi Beach to the north and Galu Beach to the south, Diani Beach features expansive white sands with clear warm waters, palm trees and numerous birds and monkeys who make a life in the extensive tropical vegetation behind the beach. 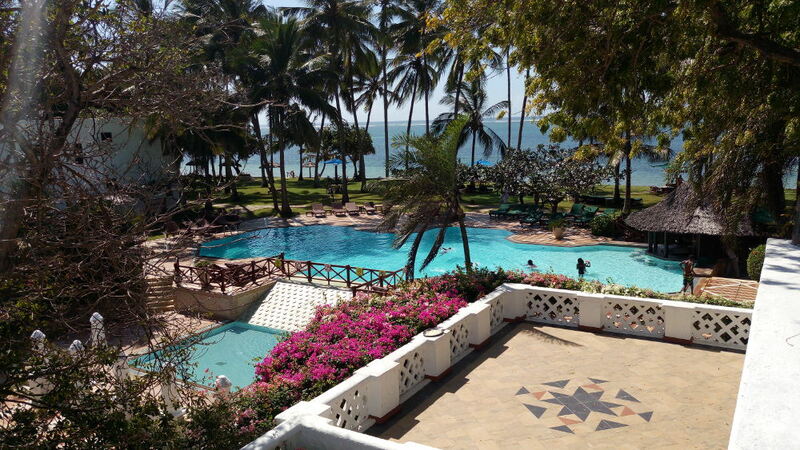 Also nestled in the tropical forest are world class hotels/resorts/villas and cottages; Diani Beach has a distinct majestic beauty and layers of treasures to explore. During the peak tourist season months from October to end of April, Kenyan seas are usually crystal clear and free from seaweed. Diani is no exception. Even during peak season the beach is never that crowded though and there are always plenty of activities to indulge in. You can even shop on the beach, as locals have erected wooden beach huts to rent or sell swimming costumes, beach attire etc. Our Tip: Enjoy a tropical "Madafu"(A traditional Swahili coconut drink) while you laze on the beautiful beach gazing out to sea. 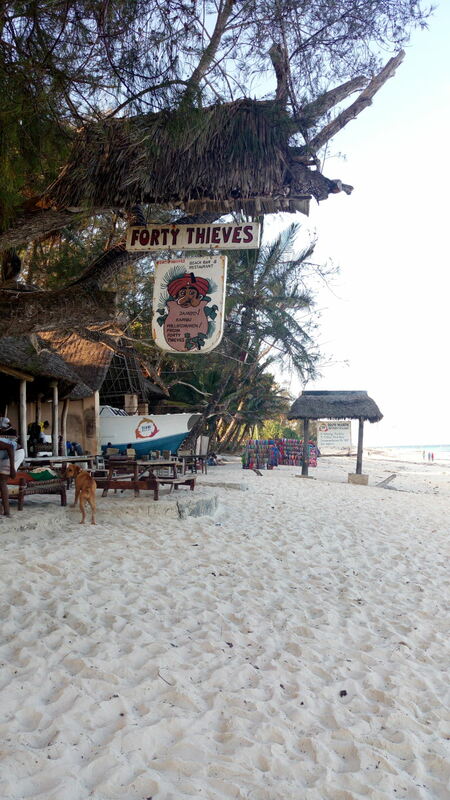 Forty Thieves Beach Bar is the most famous beach bar and restaurant along Diani. It’s the only barefoot bar and restaurant at the coast and its popular for its live music entertainment, beach games & water sports. Among its most loved offerings are the fresh cocktails and lunch menus as well as the hearty breakfasts. You've really got to visit! Ali Barbour's Cave Restaurant is in the same complex as the 40 Thieves Beach Bar Restaurant... although it does not border the beach. To go to dinner at Ali Barbour's Cave you'll need to make reservations and it opens for dinner from 6 p.m. in the evening up-to 11 p.m. If you are staying on the Diani Beach front they offer a free shuttle to and from the restaurant. 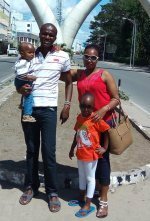 Diani Beach is well served by several world class hotels and resorts and entertainment joints suitable for everyone. Ranging from budget friendly hotels to expensive luxury accommodations. Most famous of them are the following: Baobab Beach Resort & Spa, The Sands at Nomad, Papillon Lagoon Reef, Neptune Paradise Beach Resort and Diani Reef Beach Resort. With a vast beach and calm waters, Diani Beach Kenya is the preferred venue for all sorts of water sports and entertainment. Swimming is the most popular activity for most people and you'll love the shallow calm waters and gentle ocean waves. Snorkeling: Most of the official trips out to the reef are expensive - $100 or more. A far cheaper option is to ask one of the locals to take you out in their boat - you will need to have your own mask and snorkel. Beach walks, jogging along the beach and camel and horse rides are also very common. Hotels and locals organize short boat rides and water sports. Other fun games include beach games like football, volley ball etc. Like water sports? There is plenty to keep you busy such as kite surfing, flyboarding, scuba diving, sailing and big game fishing, among others. 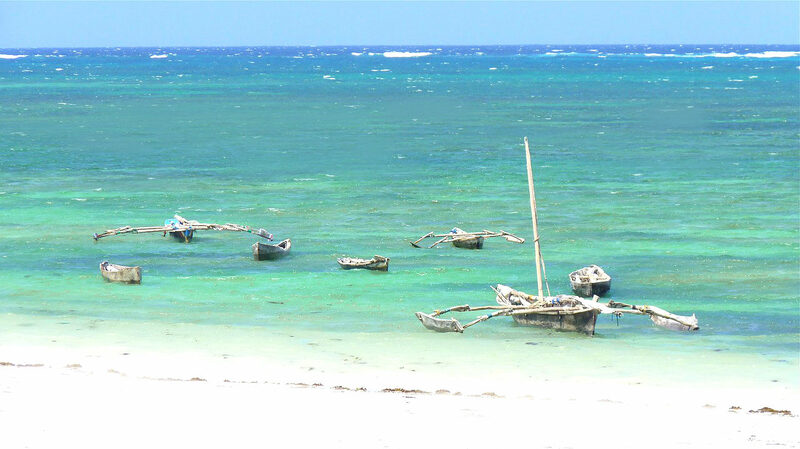 Hire a dhow or glass boat for a private tour to Diani Marine Park and Robinson Island. Explore thousands of exotic beautiful creatures, tropical fish and corals beneath. Then enjoy magical moments on the white sands of Robinson Island where a fresh breeze and warm Ocean current flow over from the nearby reef. Robinson Island is only accessible when tides are low but gets completely submerged when tides are high. Diani Beach is also famous for hosting big fishing tournaments and dhow safaris to see dolphins and migrating whale sharks. Whale shark safaris run between October and April and give you the chance to see these magnificent gentle giants. Swimming with one is truly a memorable experience. Diani Beach is also among the finest places in the world to skydive. The view as you plummet to earth from the skies and then slowly drift down to the beach when your parachute opens is one you'll never get out of your head. The combination of blues and greens is so unique - an amazing multicolored panoramic view of ocean, coral reef, beach and tropical vegetation. 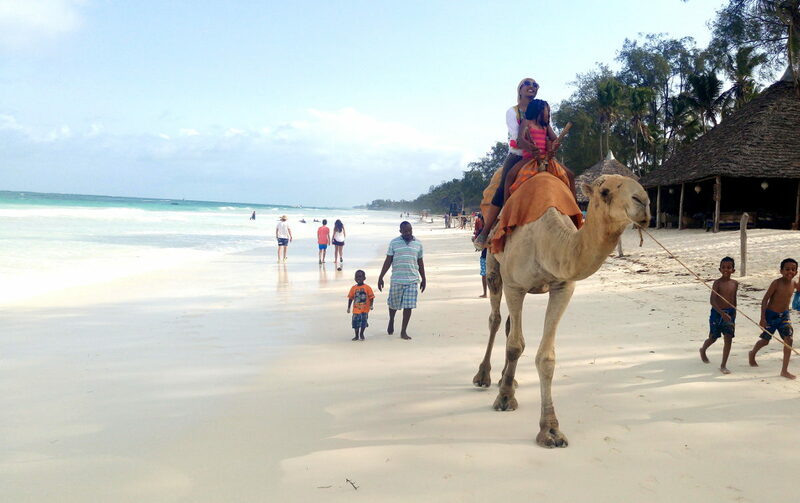 Diani beach is located about 28 Km south of Mombasa city and you can either use air or road transport. If you have to go by the road, board the Ukunda Town Matatu’s at Likoni bus stage. There are no direct pubic buses to Diani Beach and you will have to reconnect to reach Diani Beach. When you get off in Ukunda town you reconnect with the Matatu to Diani Beach. Or you can opt to get a flight and fly to Ukunda. Ukunda airport is a small airfield near Diani Beach that deals with light airplanes and charter flights.